ASPEN, Col. – This isn’t news, but neither is most of what people write about Sarah Palin and Michele Bachmann. * So: indulge me. 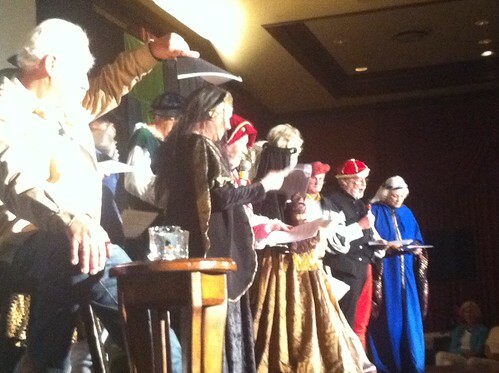 That is a photo of some of America’s leading public intellectuals dressed in Renaissance costumes and reciting Shakespeare. The woman on the far right is Sandra Day O’Connor; next to her is former Congressman Mickey Edwards. Somewhat obscured and/or poorly lit – Jane Harman, Joe Klein, Diane Ravitch, John Negroponte, Bowling Alone author Robert Putnam, Stumbling on Happiness author Dan Gilbert, and Ezekiel Emanuel, brother of the mayor of Chicago and bete noire for opponents of “ObamaCare.” Emanuel brandished a sword – and later, a chain mail helmet – as he recited the St. Crispin’s Day speech from Henry V. O’Connor went for laughs – twice – by taking the “first thing we do, let’s kill all the lawyers” line from Henry VI. The whole affair was put on by Ken and Carol Adelman. Ken, eschewing the Shakespearean garb for jeans, a western-style shirt, and a brown jacket, led the crowd in lusty cries of “Hussah!” whenever someone really nailed a line delivery. I felt as though I was being handed the opening scene for some left-wing documentary about elite decadence – Inside Job 2, Electric Boogaloo. But after getting the Marxist analysis out of my system, I realized that 1) Dan Gilbert is a funny, enthusiastic actor and 2) Joe Klein is a ham, who incorporates more physical comedy into line delivery than you might have expected. *Thanks for finding and reading this post, Google users!